In 1922, a new era begins. An era of excitement and imagination. An era when men are forthright and women are courageous. An era of globe-hopping exploration and mad science. An era in which excitement awaits in the lofty skyscraper-penthouses of New York City and the squalid slums of Hong Kong, in the frigid wastes of Antarctica and the sweltering jungles of the Congo. It is the era of Adventure! Heed the Call to Adventure! Adventure! is a game of pulp action in which you are an inspired hero battling dastardly villains and bizarre monsters! It has rich source material on early 20th-century society around the world and complete rules for playing a daredevil in this exciting age, including special powers and details on building amazing inventions. This is the core rulebook for playing Adventure!, the earliest part of the larger Trinity Universe setting. In this book, you play one of the Inspired, a hero capable of larger-than-life deeds and feats of amazing skill. The Inspired include daredevils, people blessed with extraordinary skill or luck; stalwarts, adventurers with physical abilities beyond the capabilites of their peers (and the precursors to Aberrant's novas); and mesmerists, those individuals who can employ the mysteries of the mind (and earlier incarnations of Trinity's psions). Releases: Originally published August 20, 2001, Adventure! nearly wasn't released, coming out as it did during the time when the other Trinity Universe games, Trinity and Aberrant, were releasing their final products. Art director Rich Thomas desperately wanted a pulp game, and pushed for it, and was evidently convincing enough to result in the release of a single self-contained rulebook. It served as a love letter to Trinity Universe fans, and capped off the Trinity Universe in style. What's In A Name? : Despite being the final traditionally-published book for the entire setting, Adventure! was the first to give a name to that setting: the Æon Continuum. This was changed to the Trinity Universe with the advent of the D20 versions, even getting its own Trinity Universe logo. Due to the release of the unrelated Trinity Universe manga RPG for the PlayStation, the new editions by Onyx Path are using a fusion of the two previous names: the Trinity Continuum. The Cover: The cover bears the appearance of a dime-store pulp novel, down to the label boasting a cost of 10¢. 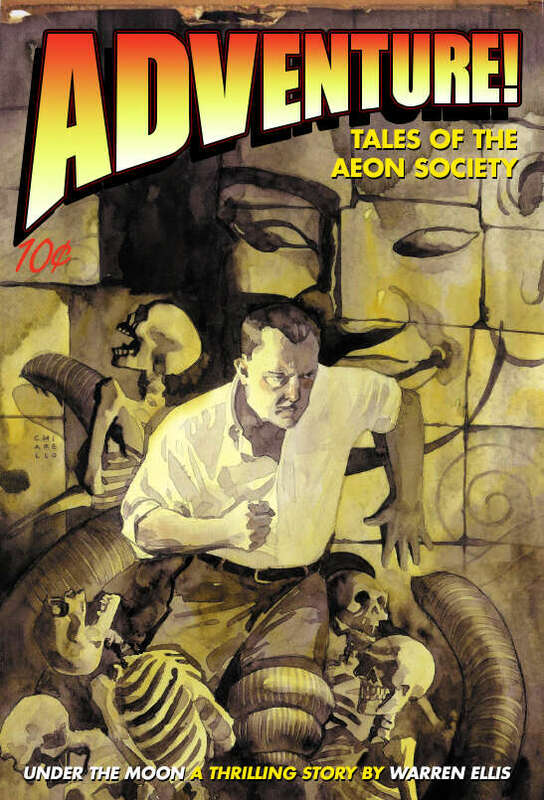 The Mark Chiarello illustration depicts an adventurer resembling Howard Hughes -- perhaps Max Mercer himself -- with sleeves rolled up, climbing over human skeletons and giant worms (or tentacles) as he descends into a stone chamber in some forgotten ruins of the ancient world. Art: The art is wonderfully evocative of the pulp genre, including frequent small text captions, as was common in the original literature. Many uncredited White Wolf staffers portrayed characters in photographs, including Ken Cliffe as Max Mercer, Rich Thomas as Safari Jack Tallon, Tim Avers as Hammon "Baron Halcyon" Banes, Becky Jollensten as Dr. Hephaestia "The Machinatrix" Geary-Wexler, Ed Hall as Jackson "Mister Saturday" Harley, Bruce Baugh as "The Czar" Ivan Boris Vladimir Staynskaya, Aaron Voss as the Ubiquitous Dragon, Brian Glass as Dr. Manfred von Zorbo, Matt Milberger as Jake "Danger Ace" Stefokowski, and John Chambers as Scalper Dutch.